Blinds Direct have a wide variety of blind types available to you including Aluminium Shutters! 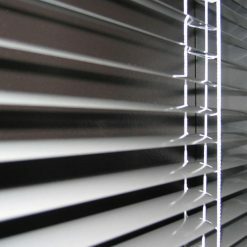 Of all the blinds to choose from, aluminium blinds have to be the safest choice. And safe certainly isn’t a bad or boring thing in this case! Available in Slat widths of 25mm & 50mm in a large range of colours. Simple & elegant, the clean lines of aluminium blinds accentuate any home or office decor. A wide variety of colours and styles are available to suit any environment. The creative mind may have a problem with the word “safe”. However, you should know that aluminium blinds offer an extent of customization that many other blinds don’t. This is because these blinds come in just about every colour! Whether you are after modern metallic or pretty pastels, you’ll be sure to find them in aluminium. Aluminium Venetian Blinds are timeless, offering a classic fashion or contemporary décor look and they available in a wide range of colours and finishes. 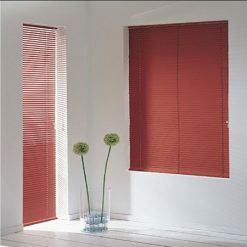 Perhaps the best property of these specific blinds is that they have a naturally modern and sleek appeal. Not only does this make them perfect for a contemporary home but also for businesses and offices. Being so versatile, there are few people that they cannot please. With blinds, you have such easy access and control of your window dressing. Effective and simple to use strings and rotator handles are used to control light and privacy. Aluminium is also very durable meaning that your blinds can literally last forever if you look after them well. What an investment! 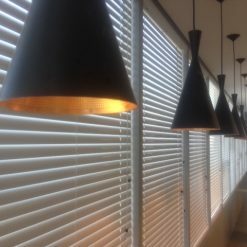 As another bonus, these blinds also make your home or office more energy efficient. Acting as a layer over windows, they keep the cold out in the chilly weather and guard against the heat in summer. That means less chance of you whipping out that heater or fan and driving up the electricity bill! Cleaning your aluminium blinds is super simple. Dust them off once a week and on the odd occasion wipe down the slats with a cloth. If you are blind shopping on a budget, look no further than aluminium! These are the most cost-effective blinds which means that you will be able to get the most bang for your buck. Affordable and stylish; what more could you ask for? Blinds Direct allows you to pick your style and colour of your blind online. If you have an oddly shaped window, don’t stress! Blinds Direct custom make what you want according to your exact specifications. Now that’s easy blind shopping! ds you will know that they can be pretty expensive. Plaswood Blinds is a much more affordable material. Therefore, not only do you get the luxurious look of wood in the form of a more resistant material; but you also pay less for it! Win-win.